Eighty nine gymnasts from Carrick on Shannon, Athlone, Ballina and Galway assembled in Renmore recently to compete in the regional level 2 – 8 All Around Gymnastics Finals. The top three gymnasts in each level and age group qualified for the national finals. 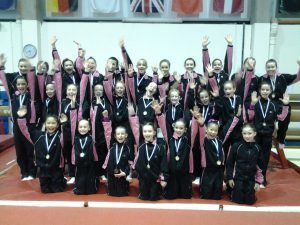 Gymnasts from Ballina’s Nadia Gymnastics Club were victorious at every level. Now all 33 Nadia gymnasts will represent their club and the west region at the national finals in March.